Note: A minimum quantity of 216 must be ordered, and in units of 72 thereafter. 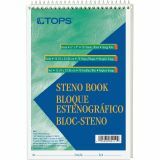 TOPS Steno Pad - Wirebound steno book features a heavy board front and back to protect contents and provide a built-in easel. Gregg rulings are precisely printed for shorthand style preference. Margin line creates two columns for notes. Coil-lock secures the wire ends to prevent snagging clothing or scratching desktops. Top-wire format appeals to both left-handed and right-handed users. 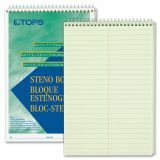 Green tint paper reduces glare and soothes the eyes. Steno book contains 70 sheets and has a 24 point chipboard backer for writing support.